It’s here and all I can think of is how quickly the past six weeks have flown by! Today’s the big reveal of my Foyer for the One Room Challenge and I couldn’t be more excited to share it with you. It’s such a happy space and am thrilled with the result! To refresh your memory and to appreciate the transformation, I’ve included a few before images in combination with the reveal images. I love the new black door painted in Farrow & Ball’s Pitch Black. It makes such stately entrance to our home. The handsome hanging lantern via Lowes was also a terrific addition. 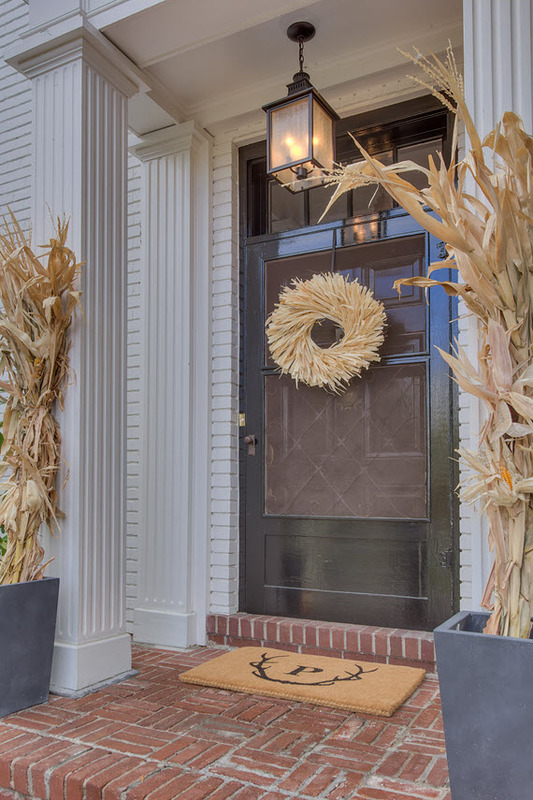 And isn’t the antler doormat by Mark & Graham just perfect? This is really a happy space. I’m in love with it all. The large-scale feather bloom wallpaper by Celerie Kemble for Schumacher sets the tone immediately. 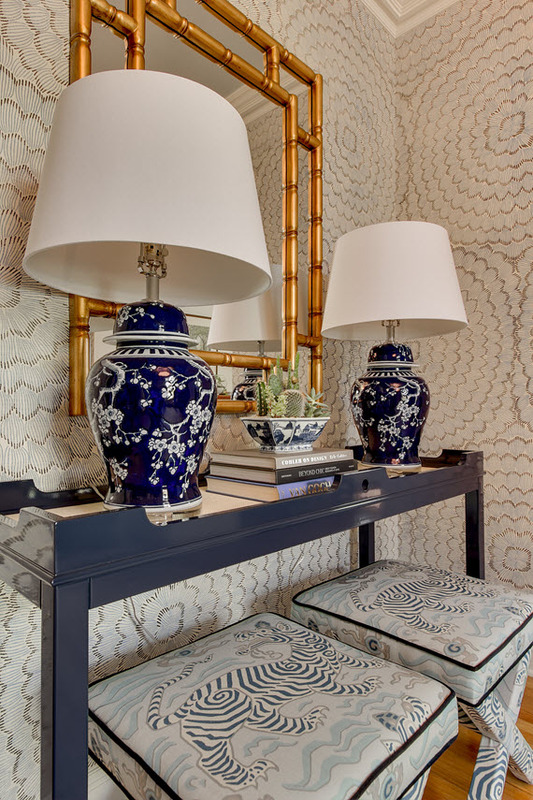 The gorgeous navy lacquer console by oomph is the perfect compliment. 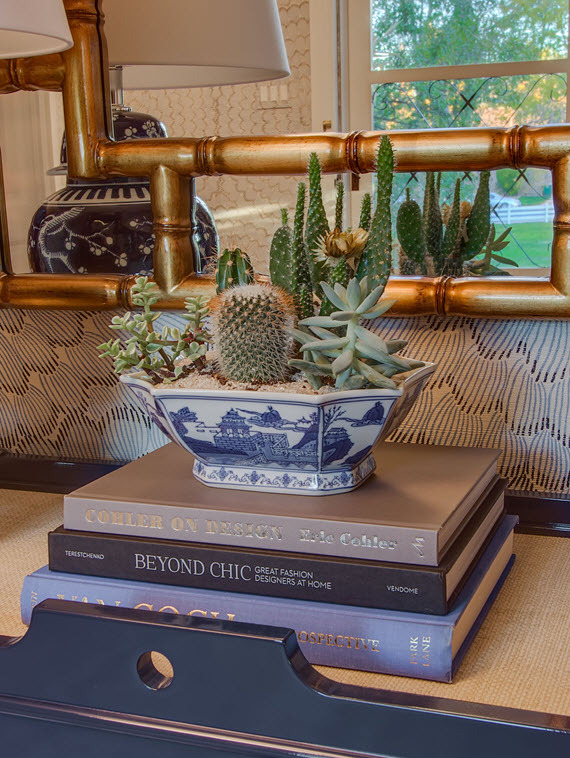 I’m also so pleased with the chinoserie chic touches in the fabulous x benches in Clarence Houses Tibet Print, gilded faux bamboo mirror, pair of elegant table lamps and vintage blue & white porcelain bowl housing the cacti & succulents. As I mentioned in this post, the stair-runner got held up in customs. Unfortunately, it still hasn’t arrived. I’m so bummed not to be able to show you a finished project, but the reality is that sometimes we have no control over these things. It’s a great lesson in patience in this need to have it now society. When it is installed, I will be sure to share it with you! I still love this image because it showcases the lovely scalloped pendant from Bellacor and high-gloss painted ceiling in Farrow & Ball’s Borrowed Light so beautifully! I also love how the staircase landing turned out. 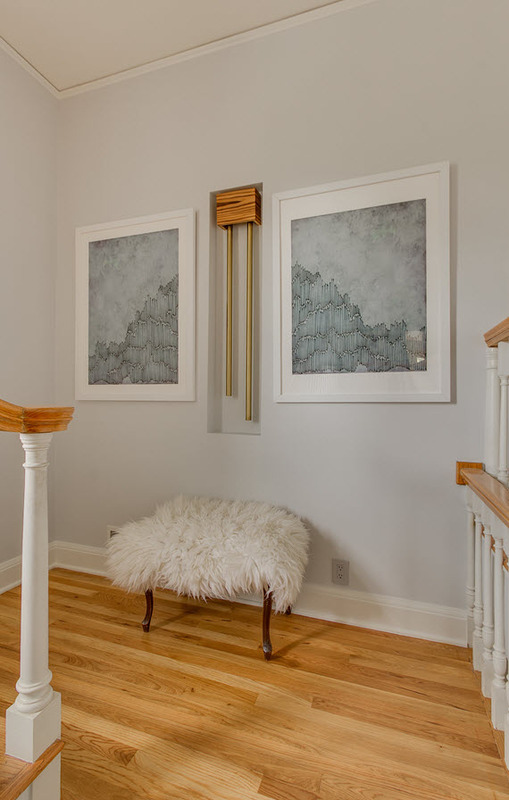 The dyptich artwork through Minted compliments the original door chimes which we modernized by adding a clean-lined teak cover. For texture and to balance the space, I added a small bench covered in a cozy sheepskin rug. At the top of the stairs, I left the original vintage chandelier – it is so timeless that it didn’t need to be changed out. 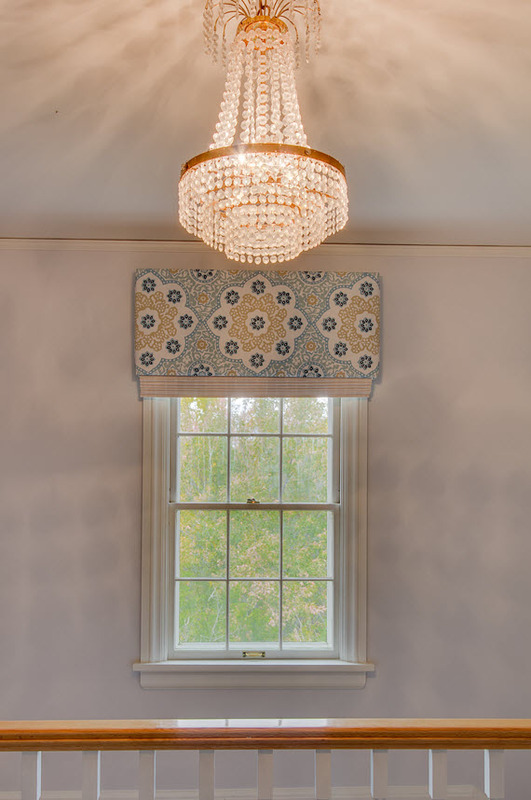 However, I updated the window valance and have it covered in a beautiful hand-blocked textile from Galbraith & Paul. It’s layered it with a matchstick woven roman shade in white. 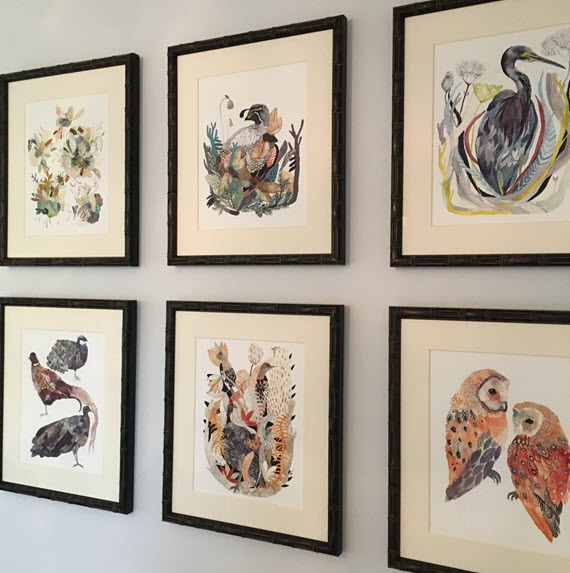 The adjacent gallery wall filled with Michelle Morin’s whimsical birds and bees is another spot that makes me smile. Thank you so much for following my One Room Challenge journey! I’ve been so touched by all the lovely comments and encouragement. Now to all the other final reveals of the other 19 ORC participants – I’m so excited to see all the gorgeous interiors from this talented group! A huge thank you to Linda at Calling it Home for organizing everything, securing such fabulous sponsors and including me in The One Room Challenge Fall 2015! It was such an incredible experience and one I’d be honored to do again! Just fabulous! Sophisticated traditional design with a right dose of ‘kick’! It looks so pretty, Cristin!! I absolutely love the paper and the blue console styling. Those benches are so cute. What a lovely space. I adore the wallpaper and those prints are to die for. Well Done!! It feels so inviting! I love all your choices and that you incorporated a mix of patterns in a way that doesn’t feel overwhelming. Beautifully done! Such a beautiful and elegant space! Thanks so much! 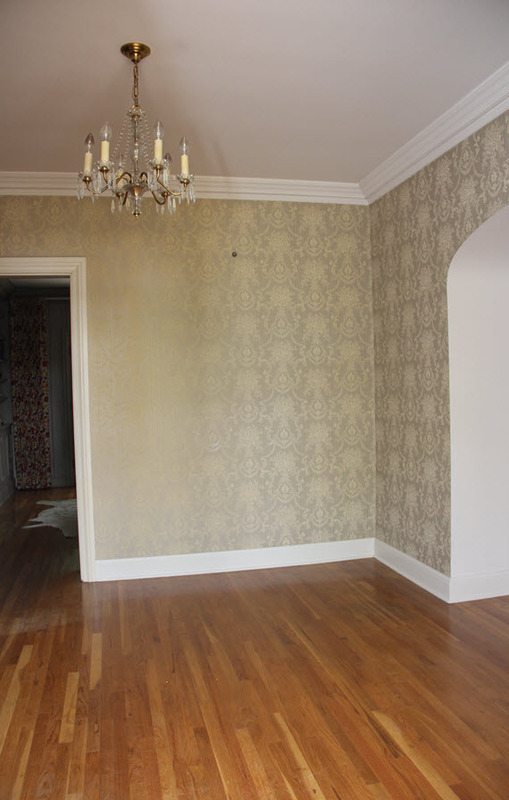 And you are absolutely right – the wallpaper needed a big enough space for the pattern. However, if the room was too big, the pattern might get overwhelming. It’s a tricky balance working with pattern and scale! ALL the heart eyes for that wallpaper!! Seriously amazing. And the simplicity of the framed prints in the upstairs hall- love. Pinning now. Great job, Cristin! You are so sweet Michelle! I hope you are well. 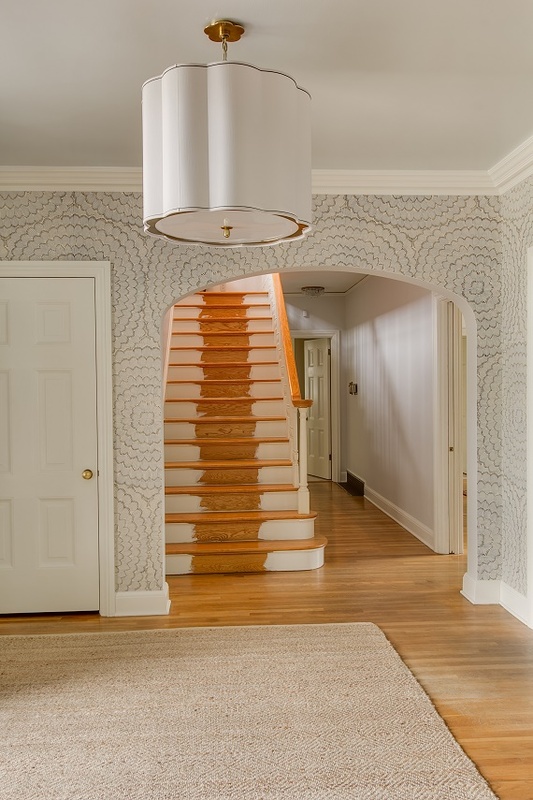 This foyer is stunning, Cristin! Wow!! That scalloped fixture is so amazing. And I love the whole console and bench vignette. Everything is so beautiful. Thank you for introducing me to a new etsy shop. I love Michelle Morin’s whimsical art work! Great job!! Thanks so much Amber! You will be very pleased with the print quality of Michelle’s art. It looks like the original! And I’m so glad you like the pendant light. It was a gamble, but I think it works beautifully! This combo kills me! The wallpaper and x-benches and that fabulous fabulous light. Great job, it’s gorgeous. I’d smile every day walking through that door. 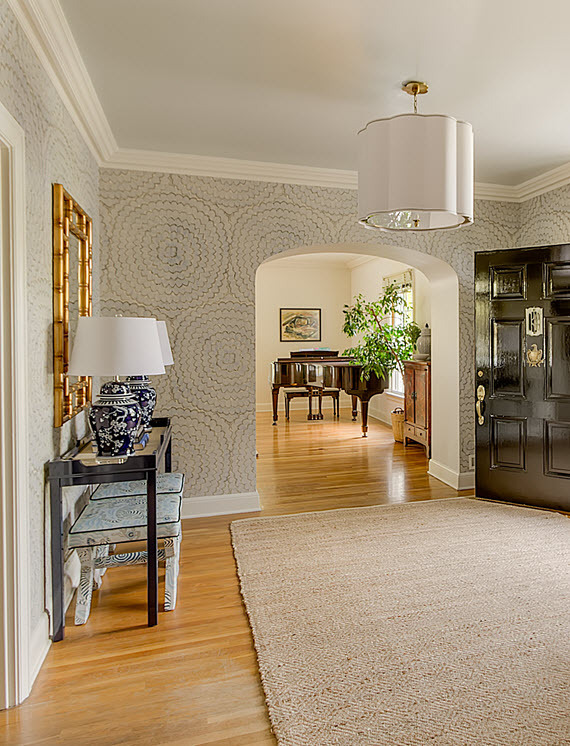 I love the painted black front doors and that wallpaper makes such a statement. You must be very happy with how this turned out. Great job Cristin! I love all things Celery Kemble. Enough said. This is a gorgeous entry. I hope it makes you smile every day. Great job and I can’t wait to see this famous runner. This is beautiful! I am in love with that wallpaper so hard. 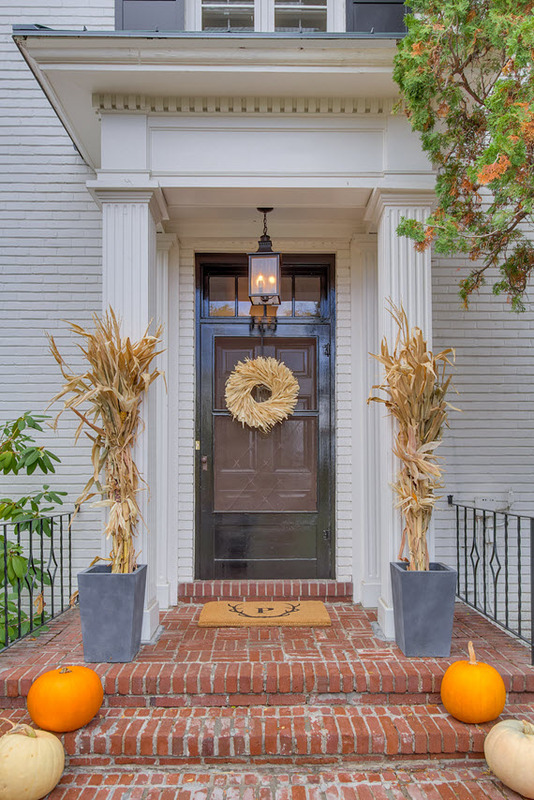 What a transformation all around even the front entry! Great job! The wallpaper is the BOMB! I have always coveted that paper. Bravo! Thanks so much Holly!!! So fun to go on this journey with you! Thanks so much for the sweet comments! It is a calm space indeed! that artwork placement with the chimes is beyond perfect. loving the entire space! great job! Many thanks! So fun taking this journey with you! WOW! Looks gorgeous! I love your choices and space came out wonderful. I would definitely look forward to coming to to that! So elegant! That wallpaper is amazing. Congratulations!!! Gosh so many things I love. That window treatment and the artwork are all so perfect. I love the beautiful glossy door and that shot of the upstairs hallway. Beautiful. Awe, thanks Courtney! I’ve love following your darling boy’s room too. LOVE the wallpaper! And the art is gorgeous. Please post a picture when the runner arrives as well; can’t wait to see it all together. Congrats, you did an amazing job! Thanks so much! I will definitely share the stair-runner once it arrives!!! Man I love that wallpaper and in combo with the benches and piping, it’s just soooo good. And the pendant light- in love with the scale and how it commands attention. Beautiful, beautiful job! Thanks so much Christine! 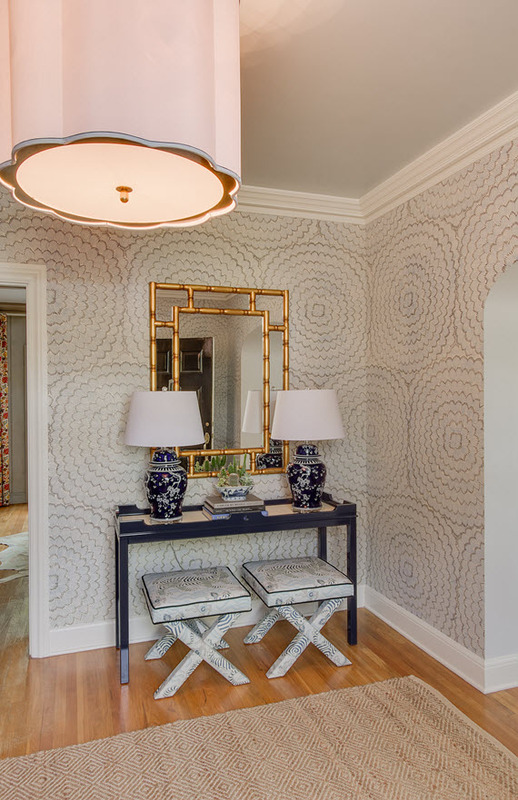 I love that pattern on pattern play with the wallpaper and benches too. Can’t wait to see your project unfold!!! Thanks so much Kate! 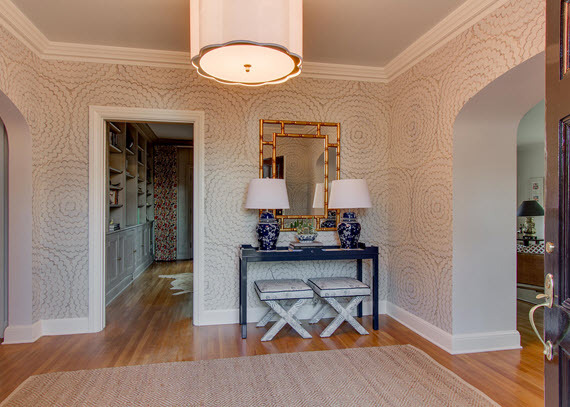 The room was just the right size to show off the beautiful wallpaper pattern without it going overboard. WOW! That is just so beautiful! 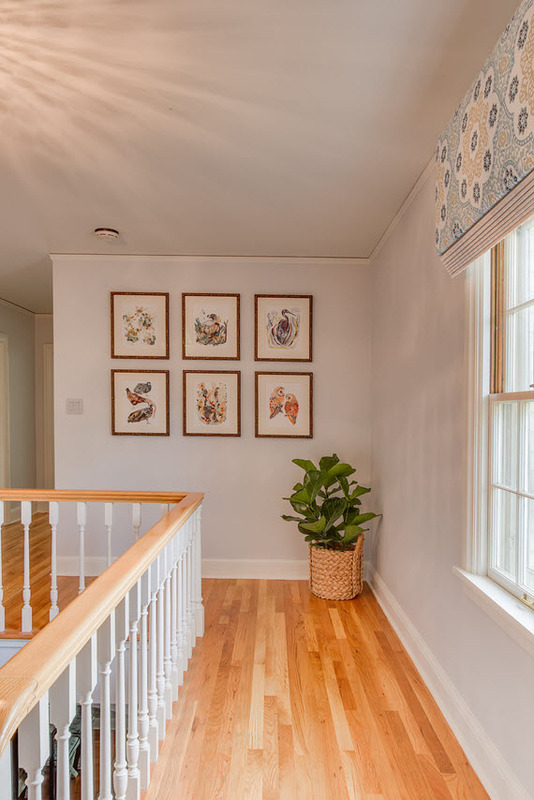 I love the wallpaper and art choices along with that sweet valance in the upper hallway. 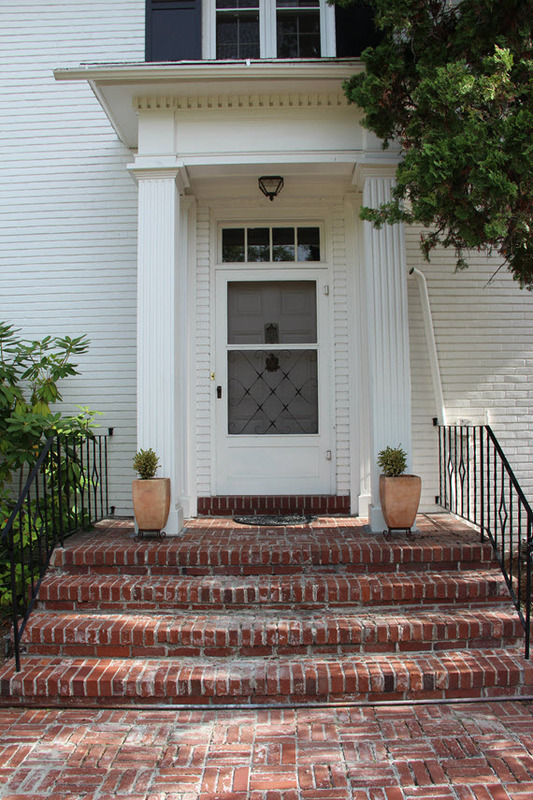 The front entry outside looks so much better..sooo inviting! Great job!! Congratulations! Thanks so much! I love that little valance too! Congratulations on completing this challenge. 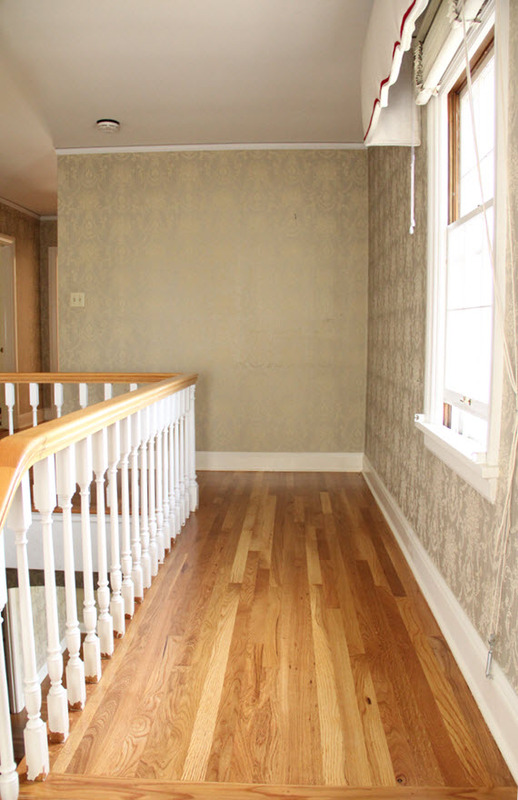 Your foyer is gorgeous! You’re right, that wall paper does set the tone. Love it!